Warm and lovely. Has held up to many washings. Little to no pilling. Update your bedroom with this simplistic three-piece flannel duvet cover set from Tribeca Living. 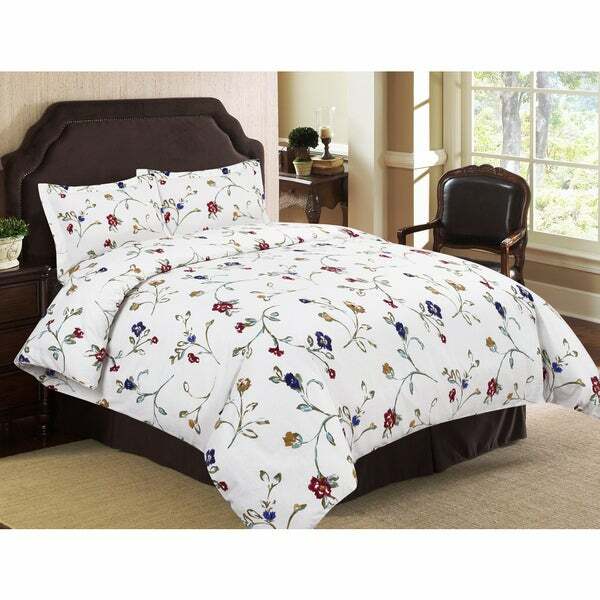 The multicolored floral design over a white background on this floral duvet cover set matches most bedroom decors while also adding a subtle splash of color to your space. This set is machine-washable, making it easy to clean and maintain. Use this lively Tribeca three-piece duvet cover set to create a stunning focal point in your master bedroom. Place decorative accent pieces in the same colors as the flowers on your bedside tables, then hang a large single-flower painting or print over the back of your bed to tie the theme of the space together. Soft flannel, oversized king, too. I had a hard time finding an over-sized king duvet cover in flannel. This one has 2 nicely made pillow king-size shams, too, for an awesome value. I have only washed it once, with white vinegar before using as suggested on the package, and there's no pilling, yet. Colors are vibrant, but the softness of the flannel stands out. Bought to match the sheet set , Floral Garden and love this just as much. Would buy again. I love this duvet set. It is sooooo soft and cozy. I don't like flannel sheets but love the feel of a flannel cover. The pattern is just lovely and I washed it before putting it on the bed and it looks great and is super soft. The colors of these sheets is beautiful and they are cozy. I would recommend these to anyone. This is a lovely duvet cover. Very comfortable, yet lightweight. I love this duvet cover, the flannel is super thick and soft. The flower pattern is beautiful and springlike. I love it! Washed well and is wonderful for colder times of the year. Great price, wish it came in more colors and patterns, I would buy them all! This is a warm and cozy duvet color. The colors are deep and rich. Washes well. This Duvet cover is absolutely heaven. It is very well made, super soft and beautiful. Love It!! Hard to make it neat looking. Have had this set for two years and it still looks new. It is a wonderful weight of flannel. Its beautiful . I highly recommend it. Great quality for the price. I like the patterns as well. The fabric has a nice weight to it that it works perfectly for our thin duvet insert. Would recommend! This set is just beautiful. Soft, warm and a design that reminds you that spring is coming. And my cat enjoys tapping the flowers. Very nice duvet cover, washes well and looks nice. "What colors are in the duvet? It is difficult to tell on my monitor"
"Does the duvet reverse to same pattern or solid? It's described as flannel--is it a heavy knit? Or is it more of a jersey knit? Are the shams also reversible, and are they pocket shams or..??" Hello orlovej, the duvet is the same pattern on both sides. This is a heavy knit. The shams are reversible. Thanks for shopping with us! Because it matched the sheets I just ordered. Liked, have sheets that match. "Is the green olive or sage"
Thank you for your question, mosetta. The digital images we display have the most accurate color possible. However, due to differences in computer monitors, we cannot be responsible for variations in color between the actual product and your screen. Have a great day.